The Audi A3 pioneered the premium compact segment when it launched in 1996. The latest generation, shown, faces competition from a sportier Mercedes A class. BERLIN (Bloomberg) -- Volkswagen Group will be relying on the Audi A3 premium compact model to provide continued stable sales growth as it fends off a challenge in upscale small cars from Mercedes-Benz. With the exterior styling of the A3 modified only slightly from its predecessor, Audi is highlighting safety systems such as video cameras that help nudge the car back into a lane if a driver drifts off track and electronic gadgetry such as a retractable flat-panel control screen for the entertainment system. The A3 went on sale on Saturday in Germany. It will take on the Mercedes A-class hatchback, which is scheduled to reach dealers on Sept. 15. The A class has been overhauled with a sportier design and accident-prevention features from the Daimler unit's flagship S class. "Audi will face tough times luring new customers with its A3 to compete with the A class," said Stefan Bratzel, director of the Center of Automotive Management at the University of Applied Sciences in Bergisch Gladbach, Germany. Mercedes, which Audi overtook for the No. 2 spot in global luxury vehicle sales last year, is countering by expanding its lineup of compacts from two to at least five in coming years. The push for small models targets growing demand from consumers in space-constrained cities. To meet tighter environmental regulations, the brands also need robust deliveries of fuel-efficient cars to offset the emissions of high-margin luxury sedans and sport-utility vehicles. The re-styled A class makes "the new A3's job that much more difficult," said Jonathon Poskitt, an analyst with LMC Automotive in Oxford, England. "The previous generation was so successful that it will be a tough act to follow." Worldwide sales of premium compact cars -- including BMW's 1 series, the Volvo V40 and Alfa Romeo's Giulietta -- will grow 38 percent this year, according to market forecaster IHS Automotive. That would swamp the 4 percent growth in the global auto market predicted by German industry group VDA. To tap growing demand for small cars in China and the United States, where hatchbacks are less popular, Audi is planning a sedan version of the A3 as part of the current generation. The model would compete with the CLA compact four-door coupe, which Mercedes showed at the Beijing auto show in April. Audi and Mercedes are packing their new hatchbacks, aimed primarily at Europe, with technology to win over new customers. The Mercedes A class boasts a radar-based collision-prevention feature and an infotainment system that can grab data from an iPhone. The model also sports an aggressive, low-slung shape from designer Gorden Wagener that's a far cry from its boxy predecessor. Thomas Weber, Mercedes' development chief, said in March that the 'A' in the model's name stands for "attack." Daimler last spring opened a new factory in Hungary to build its smaller models, then in July it struck a deal with Valmet Automotive to further expand production capacity for the A class. The Finnish contract manufacturer will produce 100,000 of the cars from 2013 to 2016. Daimler has said it has already received more than 40,000 orders for the hatchback. Audi declined to comment on A3 orders. Audi pioneered the upscale compact segment when it introduced the A3 in 1996. It expects the third generation of the model to maintain that edge, as it targets overtaking BMW for the top spot in overall luxury car sales by 2020. "I see strong arguments for why the new A3 will remain the most successful car in its class," Peter Schwarzenbauer, Audi's sales chief, said in an e-mail response. He said he expects that over the multi-year life of the model, the new version will outsell the current generation by 25 percent. The revamped model features a radar system that monitors traffic behind the car and a touchpad controller for the infotainment system where the driver can input data by tracing letters or numbers with a finger. 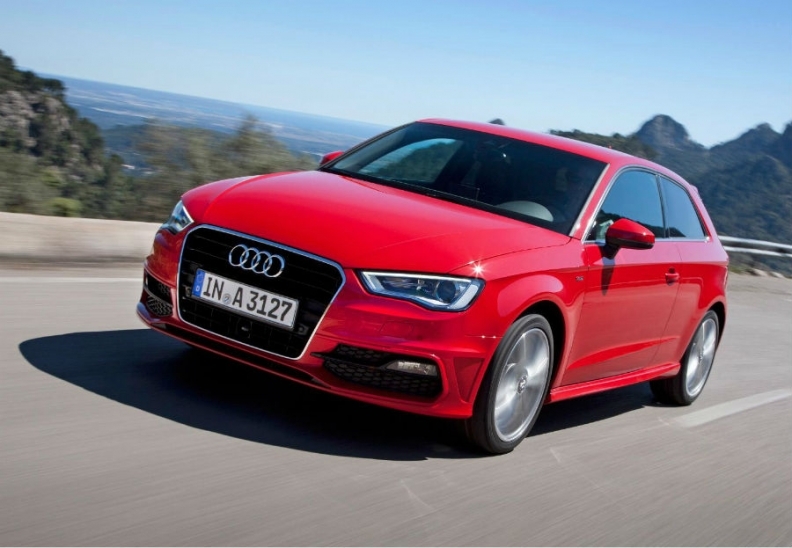 The A3, which made up 14 percent of Audi's 2011 deliveries, starts at 21,600 euros ($27,100), undercutting the A-class's base price of 23,978 euros. The lower price and new technology will help Audi maintain its lead in the segment, IHS Automotive predicts. The researcher expects sales of the A3 to jump 50 percent to 246,700 vehicles next year, beating the 173,100 deliveries of the A class and 199,600 for the BMW 1 series. That should help Audi hold on to second place in luxury-auto sales. In the first seven months of 2012, Audi's deliveries climbed 12 percent to 852,900 vehicles, while Mercedes increased 5.5 percent to 750,251. "Audi is the brand in demand," said Simon Empson, managing director of UK auto Web site Broadspeed.com. "The A3 is its bread-and-butter model, and the old generation is still moving with minimal incentives."